Can you say, the Lord our righteousness? I say, the Lord OUR righteousness. For entertaining this doctrine in your heads, without receiving the Lord Jesus Christ savingly by a lively faith into your hearts, will but increase your damnation. As I have often told you, so I tell you again, an unapplied Christ is no Christ at all. Can you then, with believing Thomas, cry our, “My Lord and my God?” Is Christ your sanctification, as well as your outward righteousness? 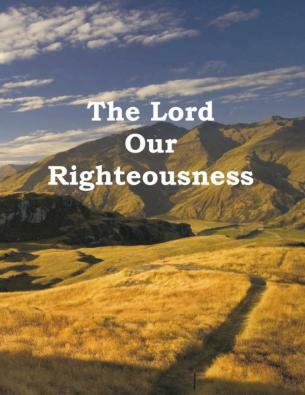 For the word righteousness, in the text, not only implies Christ’s personal righteousness imputed to us, but also holiness wrought in us. These two, God has joined together. He never did, he never dies, he never will put them asunder. If you are justified by the blood, you are also sanctified by the Spirit of our Lord. Can you then in this sense say, The Lord our righteousness? Were you ever made to abhor yourselves for your actual and original sins, and to loathe your own righteousness; for, as the prophet beautifully expresses it, “your righteousness is as filthy rags? Were you ever made to see and admire the all-sufficiency of Christ’s righteousness, and excited by the Spirit of God to hunger and thirst after it? Could you ever say, my soul is athirst for Christ, yea, even for the righteousness of Christ? O when shall I come to appear before the presence of my God in the righteousness of Christ! Nothing but Christ! Nothing but Christ! Give me Christ, O god, and I am satisfied! My soul shall praise thee for ever. Posted in Devotionals/Commentaries, Jeremiah, OctoberTagged Bible, Bible daily, Bible reading, Bible study, daily Bible, God's righteousness, Jesus the Branch, Scripture, The Lord is our righteousness. Your best life depends on the fear of God.